Ubiquity University - a whole new kind of education. For a whole new kind of world. Ubiquity University sees its mission as providing online education for the world of today, and for the world of tomorrow. The university is based on the needs we see in the world around us: to have a truly relevant learning experience, utilizing modern technology, at a price that is affordable for students all over the world. The core competencies that you learn to develop at Ubiquity are divided into three areas: Knowledge Content (the things you are going to study), Personal Qualities (the dimensions in yourself you are going to work on), and Action in the World (how you engage the world). All of your study and program-related activity at Ubiquity will contribute to the development of these core competencies. CONTENT: Collaborative creativity, not simply knowledge, is the key to the jobs and challenges of the future. 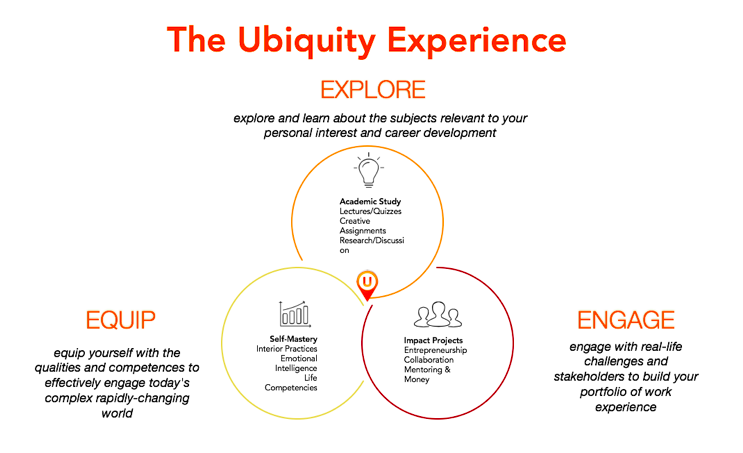 By studying at Ubiquity, students will gain both the core competencies they need as well as the collaborative creativity and entrepreneurial leadership their future demands. METHODOLOGY: Conventional education heavily relies on lectures, tests, essays, and memorization. Ubiquity's methodology goes way beyond this. In addition to lectures and tests, the course is comprised of self-mastery exercises, real-life Impact projects, and game scenarios designed for the multi-sensory student. DESIGN: Conventional schools train for degrees. Ubiquity concentrates on what the emerging generation of students actually needs -- modular competency-based learning experiences that foster collaborative creativity and develop skills directly relevant to their lives. GLOBAL CONTEXT: From their very first course onwards, students will be grouped in "pods" that will be designed to create global classrooms in which they will interact with peers all over the world. They will learn their lessons, engage in personal development, and participate in real life Impact projects with other students from around the world supported by trained teacher assistants and a coaching and mentoring program. COST Worldwide student costs and tuition are dramatically escalating as well, taking education out of the reach of millions of perfectly qualified students each year. Ubiquity will be offering programs that cost only $3,000 per year for a full-time undergraduate student, so a $12,000 BA, EMBA, MBA and $6,000 MSc. Low cost. No debt. This makes Ubiquity globally affordable. Our Online Programs In addition to the United States, Ubiquity has country partners in countries as diverse as Bangladesh, Brazil, European Union, India, Mexico, Pakistan, Russia, South Africa, Sri Lanka, and Vietnam dedicated to promoting Ubiquity as a global university. All the courses will be in English with a software that enables local language subtitles. Our commitment to all students for whom English is a second language is that by graduation, you will have professional competency in the English language. In each course, students will be grouped in pods of 8-12 students drawn from all over the world. This enables students to interact with their peers globally from day one.